Celia and her two sisters all share a special bond. Not only are they triplets, but they can also see the past, present, and future. Celia holds the past, something she has always felt useless. But that changes when she meets Lo, a soulless mermaid who cannot remember her own past. Determined to finally help someone with her gift, Celia tries to help Lo remember. But with that remembrance comes a price, one that just may cost more than they ever realized. I have to be honest that mermaids/sirens have always creeped me out. I've always had a fear of drowning, so the idea of terrible creatures who lure people to their deaths in the murky depths of the water gives me shudders. Fathomless takes that whole creepy factor to a whole new level when it adds in the mysteriousness of their change and their cold cold hearts. Somehow the fact that the mermaids were once human, but are now stripped down and soulless shells who only hunger for peace made it even worse. Add in the false hope they were given and everything about them made me shudder, even as Lo started to remember some of her past and become more human. To be honest that only made me more terrified of her, as once she got a taste of her old life, I knew she wouldn't let go without a fight, no matter the cost. I really loved the concept behind Celia and her sister's powers even if I didn't quite understand where it came from. They had such a strong bond as triplets, and yet Celia still was a bit of an outcast when you took a step back. It was almost as if Jane and Anne were twins and Celia just happened to have been born at the same time. Being able to see the past, present, and future between them is such a burden, yet at the start of the story it is only Celia who seems to be having a hard time with it as she doesn't feel the worthiness of her power. If I could only pick one thing about this story that was most enjoyable or had a lasting impression, it would be Celia's transition from being in the shadows of her sisters, and learning to have confidence and believe in herself. Don't get me wrong, there is so much more to this book, but it was Celia's path that really stole my heart. 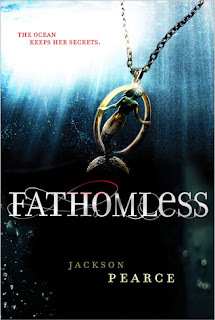 Fathomless was a rather frustrating read for me as there were several elements that just didn't feel fully developed. This was only made worse by the fact that the concepts themselves were rather intriguing, making me want to know more. Between Celia and her sister's powers and the whole "mermaid" lore itself, I just can't help thinking there was so much left unrealized. Either of the elements could have really been expanded upon, which would have ramped Fathomless from its mediocre rating from me to something fully enjoyable. It just isn't very satisfying to read something that feels lacking in the end, and in all honesty after all of the build up I have an almost sour taste in my mouth due to that frustration. Granted, I have not read the other two books in this series, but considering the fact that each book has it's own fairytale origins and are really only supposed to be companion novels, I can't imagine that would account for that much of the things that I felt were left too far unexplained. I'd go back and read the first two books, but I think that would only frustrate me more since I'm already not that satisfied with Fathomless, and it's supposed to be the series ender. That being said, I can definitely see myself reading a fourth book if one were to be written.